Inspiring and an emblem of peace. By judging the advertising sheet for Invictus you would think that the film belongs to Matt Damon and rugby. Yet the film really belongs to Morgan Freeman as Nelson Mandela, shaping the richest and most indelible portrait of the South African president put on film. When you are in the hands of director Clint Eastwood, whom is as active and agile as any filmmaker today (“Gran Torino” was his preceding effort, a box office hit), you can count on a class act. This is not to say that the film is skimpy with the on-the-field action. Rugby gets the accurate treatment as a fierce contact sport where players shred it up with body-punishing bruises. 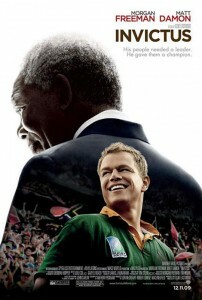 The film begins with the release of Mandela from prison on February 11, 1990 at the cessation of Apartheid. Mandela has been elected President, and his opening duties is to bridge whites and blacks together within his own offices (the whites remain on the job as political advisors and counsels). Mandela makes it very clear to the country that the past is past. British persecution of Africans is a terrible memory but, as Mandela informs, the nation cannot heal until everyone can live peacefully integrated. The Springbok rugby team representing South Africa is virtually all white except for one sole black. Damon, as Captain Francois Pienaar, is in the meantime struggling to inspire his teammates to lift themselves from a losing record. The team is nearly disbanded by a board of black officials who feel it is time to get rid of a white-dominated organization. Then Mandela steps in, with a rousing and humanistic speech, as to why the rugby team must remain in place. Blacks and whites spectators integrated at the stadium will unite as one collective people. Sports itself is the peacemaker. 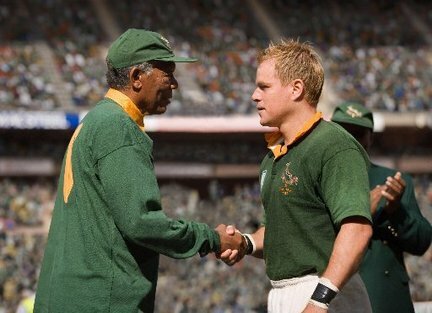 Eastwood and his screenwriter Anthony Peckham make a rousing case based on that very idea that blacks and whites can cheer as one for the Springbok, thus diminishing the racial barriers. 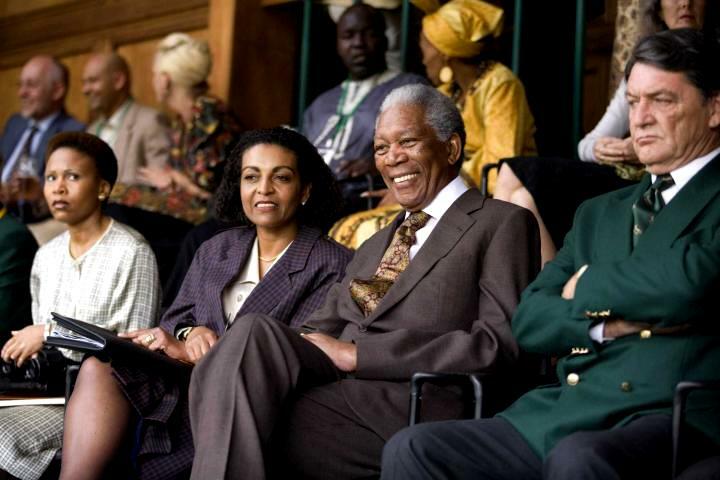 Mandela defines himself as a great rugby fan, and when he’s not encouraging other world nations to open trading and promoting human rights campaigns (sketched in, but fairly dramatized), he is attending rugby matches and watching road games on television. It is Captain Francois’ honor to join Mandela for an afternoon of tea where both men exchange pleasantries and gestures of admiration for one another, and of course, decide on an outlook on the year’s team. It could be interpreted by the viewer that Mandela’s gentlemanly manners that inspire Captain Francois to push his team into a winning franchise. A Captain must lead by example, and what Francois does from that moment on is approach every obstacle with a sense of pride and dignity. Teammates make slow but gradual adjustments, and in their changing attitudes and enlivened respect for the fans, they start to win. What the team doesn’t like is Mandela and his administration’s new requirement for the players to participate in youth mentoring and welfare programs. This leads to perhaps the most emotionally moving and transcendent sequence of the film. The Springbok arrive by bus and are enthusiastically greeted by huddles of underprivileged kids with a yearning to play rugby. Captain Francois’ team morale actually enhances while immersing themselves in the task of engaging children who have had less than adequate outlets to partake in athletics. This is one of many examples where Eastwood has pushed his ambitiousness to the limit to provide his audience with awe-inspiring footage, revealing he cares about immersing us in the authenticity of his locations. “Invictus” plays on a large canvas, as Eastwood generously employs aerial or ground level panoramas in exceptional locations which accumulatively grants the audience a rich visual education of South Africa. But the film will most obviously be admired for Freeman’s great work. Freeman takes a historical figure and doesn’t do a rah-rah showboat, but instead draws us in to the subtle and nuanced compassion of Mandela. In this particular case, you feel like you are getting an honest portrait of leadership and benevolence. That said, you only get a thin perception of the people who worked around Mandela. And while Damon is sturdy both physically and sturdy with his accent (he never sounds like he is reciting his lines, unlike the belabored Leonardo DiCaprio in “Blood Diamond”), the actor is limited to conveying the character’s broadest appeal. But this is a contemplative way of saying that Freeman is allowed to dominate the film in which he surely does. The rugby field play is heart-thumping, but it is Freeman’s words that are most stirring. Film Cousins: “Cry Freedom” (1987); “A Dry White Season” (1989); “Cry, the Beloved Country” (1995); “Moolaade” (2004, France).